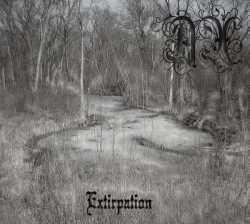 Ax are a band from Iowa that plays a very grim and primitive form of black metal and this is a review of their 2007 album "Extirpation" which was released by RuneFire Records. Drums range from slow, mid paced to fast drumming with only a small amount of blast beats being utilized, while the bass playing has a very dark tone with riffs that follow the riffing that are coming out of the guitars, as for the synths they are only used on the last song and they bring a very dark, atmospheric and epic sound to the recording.. Rhythm guitars range from slow, mid paced to fast black metal riffs that are very raw and primitive sounding along with a good amount of dark sounding melodies being thrown into the riffing as well as some atmospheric elements, while the lead guitars when they are utilized are very dark, primitive and melodic sounding black metal guitar solos and leads. Vocals are all grim sounding black metal screams, while the lyrics cover darkness, anti religion, depression, hatred and misanthropic themes, as for the production it has a very dark, raw and primitive sound to it. In my opinion Ax are a very great sounding grim, raw and primitive black metal band and if you are a fan of this musical genre, you should check out this album. RECOMMENDED TRACKS INCLUDE "Remnant Of A Lost Soul" 'Boneshatter" and "Dance Of Dybbuk". RECOMMENDED BUY.